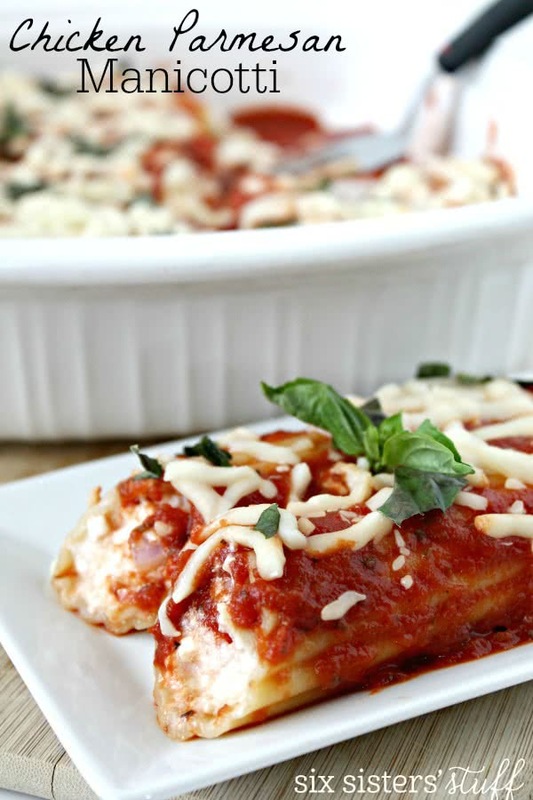 Chicken Parmesan Manicotti is the combination of two amazing dishes - stuffed Manicotti shells and cheesy chicken parmesan. It will be a new favorite! Everybody loves chicken parmesan, and everyone loves Manicotti, but have you tried Chicken Parmesan Manicotti? 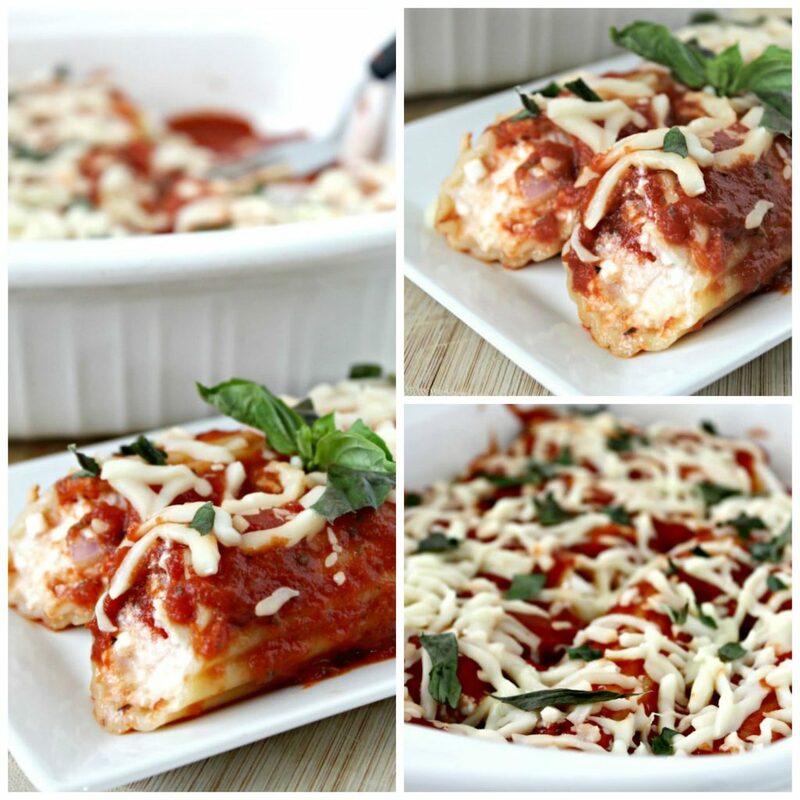 It’s all of our favorite chicken parmesan flavors stuffed into a delicious Manicotti shell. 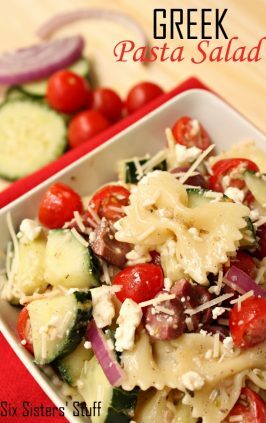 This recipe has been picky eater approved and is sure to make your family happy! 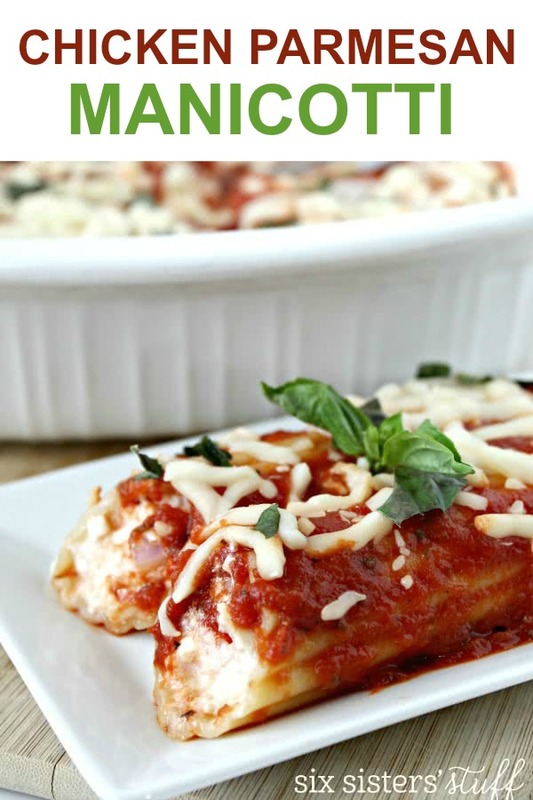 Now, if you have never made Manicotti, it is MUCH easier than it looks! Here are a few tips I have when making Manicotti. Cook the noodles BEFORE you fill them. If you fill them up when they are hard, they won’t cook evenly. I stick them in a pot of boiling water and cook them for however long the directions say to on the box. Don’t cook them too long because you still want them a little al dente so you can fill them up. When filling Manicotti, I like to use a plastic baggie that can zip. I fill it up, then cut a corner of the bag and fill up your Manicotti. Do one side of the Manicotti, then turn and fill up the other side! When you are done, just throw the bag away. Make sure when cooking that Manicotti in the oven, that every part of the noodles are covered with sauce. If there are noodle parts exposed, then those will parts will get hard in the oven. 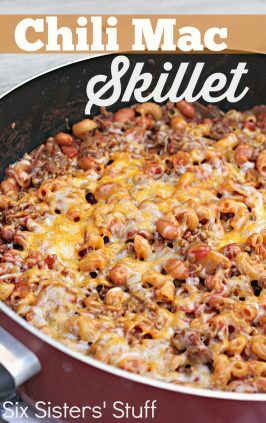 Want to make this ahead of time? Prepare everything up until it’s time to bake, cover with foil, and stick it in your fridge for up to 24 hours. Your noodles may soak up some liquid, but that will help them become soft when baking. This recipe calls for skim ricotta cheese, but if you aren’t a fan of ricotta cheese, you could easily substitute it for cottage cheese. Or you could even make it with 1/2 ricotta and 1/2 cottage cheese. I didn’t put a lot of cheese on the top of my Manicotti, but you could easily put a lot more on there. Manicotti: We use Barilla brand noodles, but store brand will work too. We start with uncooked shells and quickly cook them slightly. Like mentioned above, make sure not to cook them all the way to avoid them getting soggy. Ziploc Bags: These will come in handy when filling your Manicotti shells. We’d recommend the ones that close to avoid making a mess. 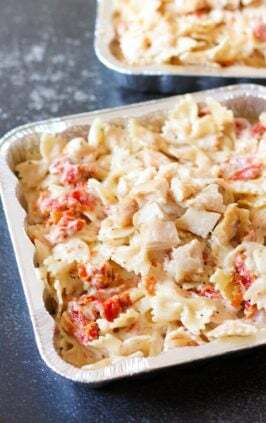 9×13″ Pan: If you are cutting this recipe in half, a 9×9″ pan will work for this recipe. Foil: Whether making ahead of time or storing leftovers, cover your pan tight with foil and place it on a level surface in the refrigerator. In a bowl, combine ricotta cheese, Parmesan cheese, 1 cup mozzarella cheese, shredded chicken, egg, oregano, salt, and pepper together. Stir until well mixed. Fill each cooked Manicotti with the chicken and cheese mixture carefully so that the shell doesn't tear (I fill a plastic bag and cut a small corner - this makes filling the Manicotti easier and then I just throw away the bag when I'm done). Spray a 9 x 13 inch baking dish with cooking spray and place the stuffed Manicotti in it. Pour the spaghetti sauce on top. Sprinkle with 1 cup of mozzarella cheese, and place basil leaves on top. Bake at 350 degrees for 35 minutes or until hot and bubbly. In this video we make our Easy Cheesy Garlic Bread. 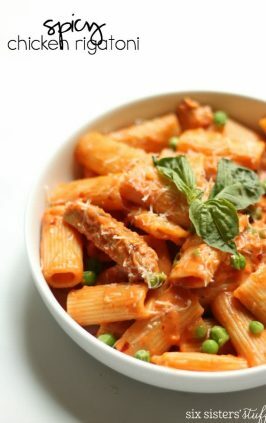 This will go perfect with your Chicken Parmesan Manicotti! Love this, love everything you do! 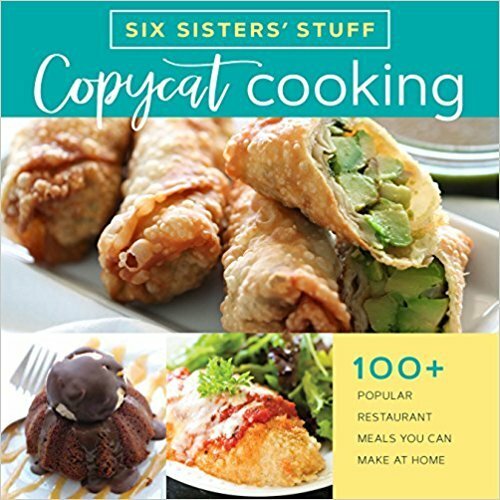 Is there a way to Pin this recipe and I missed it? Pin it button and magic button are coming!! Yay! So good to know! I do usually make it at lunchtime and put it in the fridge for a few hours so the evening's not so busy, so maybe that helps the noodles soak up some liquid. We like our pasta a bit saucier, but liked the filling. How much sauce do two, 14 ounce cans of diced tomatoes make? I'm looking to cheat and just use my normal jar sauce that I "doctor up" with tomato paste and herbs. A ziplist button would be awesome too! I'm thinking of using this recipe as a lasagna.... yum! I'd like to try this recipe! 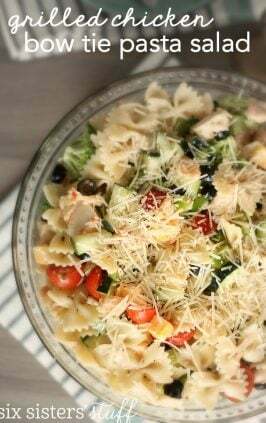 I love the twist of adding chicken which is perfect as we are a smaller family & when I cook chicken I often have left overs! Visiting from thanks for sharing! I never saw a direction on what to do with the other half of the mozzarella cheese. Is it supposed to I in with the chicken mixture? Sorry about the confusion. We made the change to the recipe. 1 cup of the mozzarella does go in with the chicken mixture. Absolutely YUMMY! Even my picky preschoolers and husband loved it. Thank you for sharing.